How would you fare if a news publication offered you to “name your price” for a photograph from your archive that you knew was likely to be taken out of context? 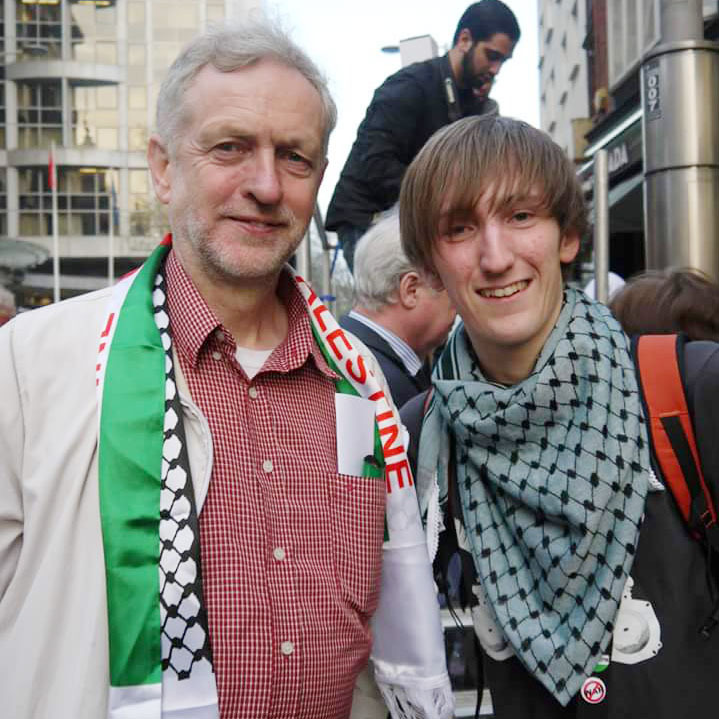 That’s exactly the conundrum photographer Samuel Hardy was faced with last Saturday when approached about a photograph he’d taken of Jeremy Corbyn at a pro-Palestine march in 2012. For those that haven’t been following recent events in the UK, left wing veteran politician Jeremy Corbyn, the man seen smiling in the above photograph has just been elected leader of the Labour party with a landslide victory, despite starting the race as a 500-1 outsider. His rise to power has been a source of continued contention by the press and prominent figures within the party he now commands and it seems that some are still trying to make the mud stick. 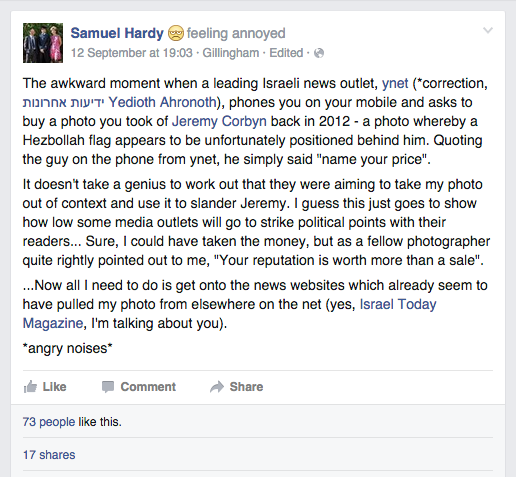 Samuel Hardy was recently contacted by leading Israeli newspaper ידיעות אחרונות Yedioth Ahronoth about a photograph he had snapped and uploaded to stock agency Demotix of Corbyn, but it didn’t take him long to suss out what was so special about the image. He recounted the conversation on his Facebook page. Remarkably, Hardy, who is a Jeremy Corbyn supporter and who voted for him in the leadership elections declined the offer to name his price and removed the photograph from sale. Refusing to sell the image knowingly to an organisation that was going to misrepresent for political gain is a test of ones morals or as Hardy points out, his reputation. The issue here, unbeknownst to Hardy at the time was that the yellow flag Labour’s now new leader was standing in front of and looking cheerful is that of Hezbollah, the Lebanon based Shi’a Islamist militant group, an organisation officially designated as terrorists by much of the West, including the UK. Jeremy Corbyn was [by] himself just standing to the side listening to the speakers. I turned to get a shot of him and he smiled back at me – at the time, I did not realise that the flags were of the Hezbollah group (had I realised at the time I might have tried to framed a photo without the flag), although it was clear to me that Jeremy was not posing with the flag – the two men behind him were simply passing by. Hardy has said that he is following up on a few of the Israeli bloggers who stole the image before it was removed from all online sources but doesn’t expect to hear anything back from them. In the meantime though he received a response from the publication who have said they’ll respect his decision not to sell. How do you feel about the photograph and what it depicts? As a photographer would you have handled the situation differently? Let us know your thoughts in the comments. The above photograph was used with EXPLICIT permission granted by the photographer. Please don’t be that guy; if you want to redistribute, please contact Samuel Hardy on samuel.hardy@blueyonder.co.uk for licensing requests. Integrity. The one thing thing that can’t be bought. Are you serious? 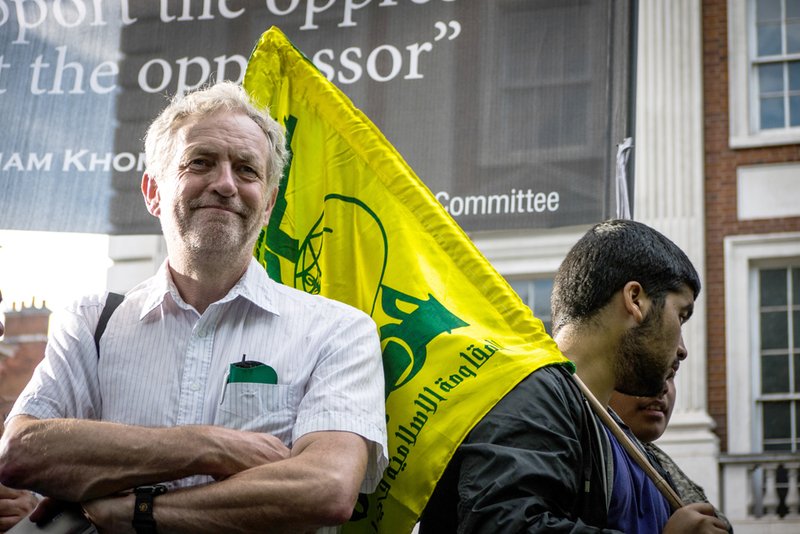 “Corbyn’s choice to attend the same rally as Hezbollah?”. It was not a Hezbollah rally though undeniably supporters of Hezbollah turned up. He was there to support Palestinains. Look at it another way. If Roy Hodgson coached the England football team from the dugout at Wembley and elsewhere in the ground some supporters displayed an England flag with the letters EDL scrawled on it, would you be asking if this suggested that the England Manager was a racist English Defence League supporter? The photographer in this story clearly has morals and integrity. In posing the question you have in the way you have you are behaving like some of the shoddier sections of our media. It is a god job that we have people like Samuel Hardy around to remind us all what decency is. You would have been far better if you had posed a question about the photographer’s stance. Something like, “do you think the photographer was a fool to turn down the offer of cash or should he be applauded for thinking of others before himself?” I know my answer to that question. I don’t beleive that the question you ran with deserves an answer. It is a shame that you didn’t focus your question to readers on the essence of the story which I guess is about people having principles and sticking to them. I’ve altered the question at the bottom slightly in response to your comment, however I still think it’s a reasonable one to ask considering the article is completely unbiased. NB. Phogotraphy worked with the photographer on this article to obtain all relevant information and our intention is and always has been to present the photograph with an objective, factual comment which can be referred to before it gets misrepresented on social media. I’m not sure I understand your logic in saying it’s fair to ask if Corbyn being at the same event as 2 strangers with a Hezbollah flag is ‘context’ given your “completely unbiased” article. Are you saying that he should ignore Al-Quds day because a speaker from Hezbollah is in attendance? Thank you – but to be honest it still feels loaded to me, as if he had a choice as to whether or not supporters of Hezbollah turned up at the rally. And the photographer has already explained that he is a) a supporter of Jeremy Corbyn and b) had he known what the flag was he would have framed the shot differently. So to ask if it is “acceptable to mark it down as a random coincidence” seems to imply that there is the possibility that this was not just a coincidence. Having read the article i don’t know how you could think there could be any other explanation. But I appreciate your efforts to modify the question which is not as leading as the original. So what! Hezubllah supporter is walking or standing behind him. Looks like the man with the flag is having a seperate conversatin with someone else. If this flag is illegal, I did see another clip of a British policeman walking by the exact man who is holding the flag. Should the officer be found guilty of direlection of duty? Inquiring mind wants to know. I am also sick and tired of the Jewish controlled media trying to blackmail UK public officials as they do in the good ol’ USA. I love and admire Corbyn. Stop the diry Zionist blackmail and smear campaign against this British patriot, named Jeremy Corbyn. You made absolutely the right choice. We need to stop the notion of selling anything and everything. I had assumed the issue was the words “the oppressor” above his head. Reblogged this on Bampots Utd. If it was Margaret Thatcher in a similar position would the same photographer have the same integrity….I think not. If Margaret Thatcher was loved by public then people would show it to her, it’s her fault not photographer’s. The image was submitted to Demotix and they are the ones who sell the image on. The photographer would not be contact. What a fantasist. Very interesting article, thought provoking, I enjoyed reading, thanks very much for sharing. That’s a tough one, most photographers with a conscience would struggle with. Name your price is presumably within a range of what a newspaper normally pays for a photograph, which I imagine is from zero up to $10000s, which is potentially a large sum, but not a retirement package in the Caribbean. I think the guy did the right thing, if that is what he believes, he stood up for it. Integrity as one of your other readers said. Within that he had posted the photo on an agency site, which presumably the sole purpose of so doing is to find clients to buy one’s work. My question would be – why did he post it, if he knew it could be used to spin a story in a direction he didn’t agree with. Wouldn’t one simply keep that shot private ? I ask this because some might contemplate that the whole thing was done as a publicity stunt, which could have more financial benefit than the original offer from the newspaper for the individual photograph … I’m not saying that is the case, just posing it as a possibility. Hi Don, from our discussion with Samuel we are lead to believe he didn’t realise the flag had any relevance at the time of taking the photo or when uploading it to the site. I tend to try to look at all angles, especially the ones which aren’t so obvious … I’ve done a fair amount of opinion blogs on my blog – being bombarded with opinions I’ve found very rewarding insofar that I’m often able now as a consequence to see many angles in any story … even the more unsavoury ones … other people get to voice their opinions, and I always learn something. PS love the blog name, very cool indeed !